Flixter is all about movies. With this app you can take a look at the movie reviews. It will also let you know about the show times. Moreover, you can also watch the trailers of any movie. Flixter is free. With the help of this app on LG Thrill 4G, you can check the time of your flight, book a flight, room or car rentals. The app deals with different websites to find the best price on a flight. Get it for free. It’s one of the best apps in the market that lets you read any book from a collection of 900,000. Some are available for free and you can purchase the others. Amazon Kindle is available for free. Do you want to protect your phone from malware and viruses? Install Anti-Virus Pro. It can scan all of our apps, files and settings. You can get it for $9.99 only. Another great app that lets you manage your files without connecting your phone with the computer. It’s available in both free and paid versions. Free version is ad-supported. DropBox on LG Thrill 4G makes it easy for you to upload files on your DropBox account so that you can access it from anywhere. DropBox gives you 2GB of space for free and you can download it for free, too. Lookout protects your phone from viruses, malware and the best thing is that it can locate your phone on a map if it is stolen. If you can’t find your phone, you can make your phone “Scream”. Opera Mini Web Browser provides fast browsing in your Android device. You can have tabbed browsing and you can also sync your bookmarks between your phone and desktop. Download it for free. Most of you use Facebook. Install this app and you will be able to access all the basic features easily through your phone. It’s available for free. If you have an account on Skype, Facebook, Windows Live Messenger, Yahoo!, GoogleTalk, AIM, ICQ, MySpace, or StudiVZ Hyves, Nimbuzz lets you chat with all of your friends on all of these websites and messengers. Install it for free. ESPN ScoreCenter gives you all the ESPN sports coverage on your LG Thrill 4G. It lets you get the real-time scores. You can get this app for free. Install this app and you can have almost every calculator function in your phone. No need to purchase any more scientific calculators. Best of all-it’s free. Wikirdroid formats the Wikipedia articles for you Android device so that you can search easily. Voice search is also supported. Get this app for absolutely free. It can flush temporary library and defragment you phone’s memory so that your Android device can run at its best. No need to pay to optimize your phone’s memory-It’s free. This app lets you find the gas prices in your area with the help of a map. It’s available for only U.S and Canada. If you are a U.S citizen or live in Canada, it’s recommended for you. U.S traffic provides you the traffic details in your neighborhood. No matter where you are in the U.S, this app can work for you. This app has everything you need to know about weather. It lets you know about hourly, 10 days or even 36-hour forecasts. You can also watch the live video from TV channel with this app. It’s free. Take a picture of any landmark, logo or an object using your LG Thrill 4G and this app will provide you with relative results. This app will also provide you the information about businesses by displaying their name in the camera preview. Slacker Radio is very much like Pandora. For example you can create you favorite radio stations but there is something different in it. This app can save the music on your devices so that if you go to a place where there are no signals, you can access your music offline. 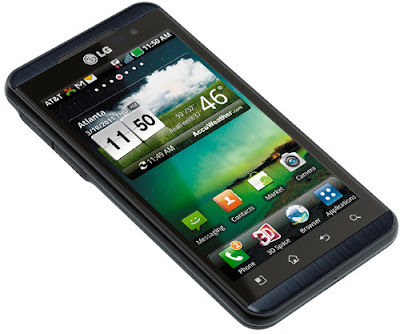 This is the official Twitter app for LG Thrill 4G and it’s one of the best Twitter clients available for your Android. You can access all the basic features easily. It’s available for free.